Certification of the E190-E2 clears the way for delivery to launch customer Wideroe of Norway, which plans to start service with the first of its 114-seat jets on April 24. Launched in 2013 along with the larger E195-E2 and smaller E175-E2, the E190-E2 gained certification in 56 months, precisely on schedule. Four flight-test articles clocked more than 2,000 hours in the air since first flight in May 2016. Embraer also conducted some 45,000 hours of tests in laboratories with rigs dedicated to aircraft avionics, flight controls, and electrical, hydraulic, and environmental systems. In January, Embraer announced a series of positive adjustments to the E190-E2's performance and operating cost profile. Aerodynamic improvements resulted in a decrease in the E190-E2’s fuel burn rate by 17.3 percent compared with the E190-E1, as opposed to the original estimate of 16 percent. The company attributes the improvement to better-than-expected performance of the new wing, and aerodynamically “clean” fuselage and the “smart” use of the airplane’s fly-by-wire controls. It also cited a weight control program that allowed it to achieve its weight goals precisely on target, flap slap and slat optimization during the flight test campaign and drag reduction on key elements for takeoff performance such as landing gear. Hot-and-high improvements have resulted in an increase in range out of London City Airport to 2,200 nautical miles, allowing the E190-E2 to reach markets in Russia, Egypt, and Turkey. The company expects to gain certification for London City within two years, explained program director Fernando Antonio Oliveira, who named E1 operators BA Cityflier, KLM Cityhopper, and Austrian Airlines as likely candidates for flying the E2 in and out of LCY. From Mexico City, range increases to 1,600 nautical miles, extending the E190’s reach to Canada and South America. 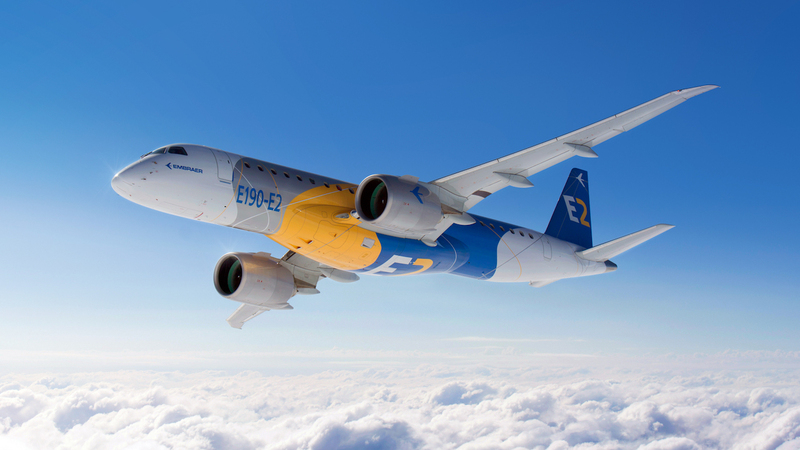 Embraer also sees a lot of potential for the E2 in hot-and-high markets in China, where it already claims an 80 percent share of the market for airplanes in the 190’s seating category. The company now counts five Chinese operators flying 100 aircraft. Embraer Commercial Aviation marketing vice president Rodrigo Silva e Souza explained that aerodynamic fine-tuning that resulted in the performance improvements also translates into a reduction in aircraft noise. Specifications show that the E190-E2 generates a 20 EPNdB margin on Stage 4, equating to a 3 EPNdB improvement over original expectations. Of course, the fuel burn reduction resulting from the aerodynamic improvements also reduces emissions, and Embraer estimates that 1.3 percent better fuel consumption translates into about 1,700 tons less CO2 emissions per aircraft over 10 years. Finally, Embraer now expects that pilots will need only two and a half days of transition training for the E2, or half a day less than the original plan.